"The best diplomat I know is a fully activated phaser bank!" 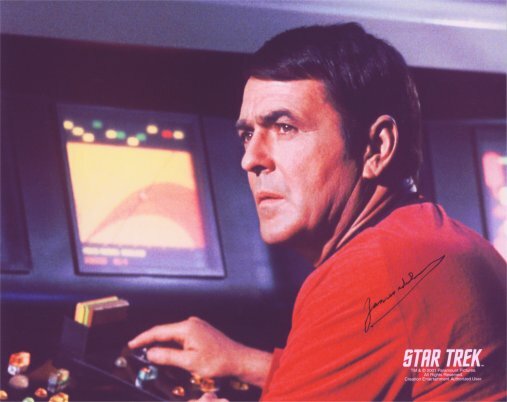 This great picture of Scotty in Star Trek has been signed by James Doohan. Montgomery Scott (referred to as Scotty by his shipmates), serial no. SE 19754 T, was the chief engineer of both the USS Enterprise and the USS Enterprise-A of over a period of nearly 30 years. This is an official licensed Star Trek photograph. As you can read below, James' health is sadly ailing and he has become a highly sought after signature. He no longer signs at all. This picture was signed after James had been diagnosed with Parkinsons disease and is therefore slightly 'shakier' than some of the earlier examples of his autograph. Nonetheless this a 100% authentic signature from a Star Trek legend and a true gentleman. James Montgomery Doohan portrayed Montgomery "Scotty" Scott on Star Trek: The Original Series and the first seven Star Trek movies. He was born on March 3, 1920, in Vancouver, British Columbia. During World War II, he served as a Captain in the Royal Canadian Artillery. After the war, he started work in radio, but quickly branched out into TV, movies, and plays. A skilled voice actor, Doohan contributed many voices to both the original series and the animated series, including (amongst others) Lt. Arex. Since the end of the Star Trek TV series, he has kept busy speaking at colleges and Star Trek conventions. Sadly, in July 2004, Doohan announced that he had been diagnosed with Alzheimer's disease in addition to his existing Parkinson's disease and diabetes, and would be withdrawing from public life. His final public appearance took place on August 31, 2004 - at the ceremony for his star on the Hollywood Walk of Fame. 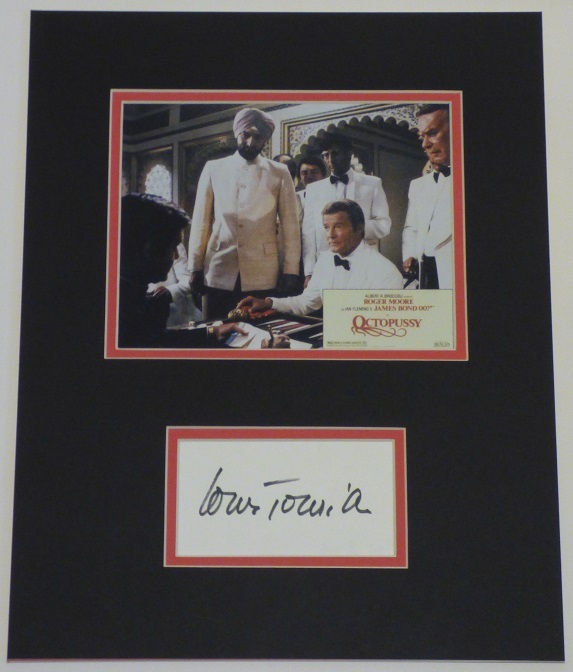 There has already been a huge leap in the value of James' autograph making this a highly collectible investment piece. Widely referred to by his nickname, “Scotty", his reputation aboard the Enterprise was that of a 'miracle worker'. This was brought about by his reputation for being able to effect starship repairs in much shorter time periods than were generally accepted as being required. Scott later admitted that he often padded his stated times needed for repairs, in order to appear that much faster. Star Trek is a global sci-fi institution. It seems incredible that it is now nearly 40 years since Captain James T. Kirk first began captivating audiences the world over. With The Next Generation, Voyager, Deep Space Nine and Enterprise winning generations of new fans, Star Trek is as popular as ever! This is a wonderful opportunity to bring part of the Star Trek magic into your home. On Earth, we have a saying: Fool me once, shame on you. Fool me twice, shame on me.